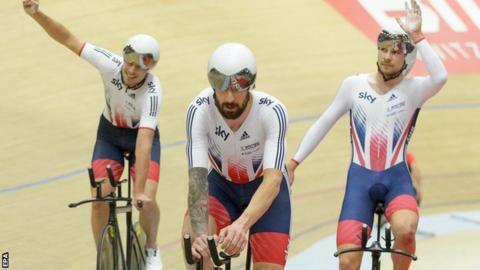 Sir Bradley Wiggins leads Great Britain's squad in the three-day opening round of the Track World Cup in Cali, Colombia, beginning on Friday. The four-time Olympic champion, 35, who plans to compete on the track at Rio 2016, is part of a 17-rider squad. Four-time world champion Ed Clancy is again absent with a back injury. Team coach Iain Dyer said: "We have selected a strong squad as we look to keep scoring vital qualifying points for the Olympics in Rio." The squad is largely the same as competed at the European Track Championships in Switzerland earlier this month, where Great Britain's men and women both won gold in their team pursuit finals. Dyer added: "We had some really promising performances at the recent European Championships and we'll be hoping to take that form into the first Track World Cup of the season." Men's sprint: Jason Kenny, Philip Hindes, Lewis Oliva, Matt Crampton. Women's sprint: Katy Marchant, Victoria Williamson, Jess Varnish. Men's endurance: Jon Dibben, Andy Tennant, Sir Bradley Wiggins, Steven Burke, Owain Doull. Women's endurance: Ciara Horne, Joanna Rowsell Shand, Laura Trott, Elinor Barker, Katie Archibald.